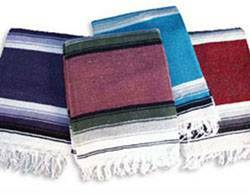 Mexican Yoga Blankets may be the most versatile yoga prop. Two or more provide a stable but yielding surface for shoulder stands. Blankets can substitute for a bolster in restorative poses and pranayama practice, and give warmth under and over your body for final relaxation.